Full disclosure: I’m not an unbiased reporter when it comes to Delta. I’ve been flying them almost exclusively for a long time, even before I moved to Atlanta over two decades ago. That said, I never had particularly high status within their SkyMiles program. I’m not a Diamond Medallion or a Million-Miler. I made Platinum Medallion last year due to a number of overseas trips I took while president of an international association. At the end of the article I address the August 8 system outage, but this article was written a week ago. A few weeks ago I was headed to Indianapolis for a conference. As is my habit, I try to stop by the Delta Sky Club for breakfast if I have time prior to a flight. In this case I was there later in the morning, so they were transitioning from breakfast to lunch as I was getting ready to go to my gate. The typical lunch spread includes cookies, so I decided to pick up a peanut butter or chocolate chip cookie on the way to the gate. Holy smokes! The new lemon cookies in the @Delta Sky Club are amazing! I joked that they should put some in first class on my flight to Indianapolis. They suggested that I take some Biscoff cookies, and I responded that those cookies were now in second place. Later, when I posted a photo showing that I had arrived in Indy, the team responded and was glad that I had a great flight, and thanked me for the photo. I responded that I just wished I had some of those cookies! All in all, this was just a charming exchange that shows Delta to be an interested, fun, and social brand. 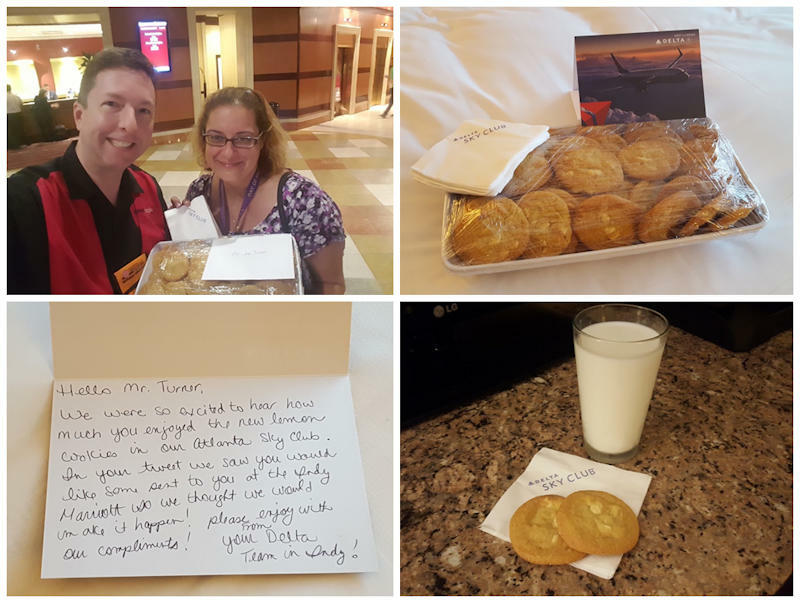 Indianapolis Delta Sky Club Station Manager Christa Khalileh surprised me with a platter of lemon cookies and a thank you note. I replied with a milk-and-cookies nightcap that night. I found Ms. Khalileh standing in the lobby with a platter of approximately three dozen lemon cookies and a thank you card. She said they had seen my Tweets and thought it would be fun to make it happen. I told her I couldn’t believe that they had done this and that I was certainly surprised and grateful. I asked her if she had tried one of the cookies yet and she had not. She explained that they had not gotten those cookies in Indianapolis yet; they had actually flown them up from Atlanta especially for me! This was a spectacular experience and a great illustration of how a brand can use social media effectively, translate it into a magical real-life experience, and reap lasting goodwill from people beyond their normal audience. Delta has a social media team that pays attention. In the past when I have had complaints or even just gripes about the usual traveling woes, they have responded quickly and professionally, usually with a helpful tip or at least genuine empathy. I have tagged them in positive posts, too, and they usually respond with a “Thanks!” or “Yay!” or other good-natured comments. They are quick to respond, and come across as polite and appropriately happy or unhappy when doing it. They nearly instantly validate whatever emotion I am feeling at the time of my Tweet. Another thing they are doing right has to do with honesty about their promises. They recently combined their sales and customer service back into a single point of contact. While many companies shy away from having potential customers (sales) see the potential complaints (customer service), Delta is transparent. They actually deliver negative feedback to people who can change policy. How many times have you wondered whether your complaint was really “shared with the management” when a customer service representative said they would do so? I have often wondered whether it happens. But on the same day as the cookie delivery, Delta announced that – due to feedback from their customers – they were adjusting an upgrade policy that had been changed. They don’t shy away from admitting that changes might be necessary, and they credit the customer when making the correction. Perhaps most importantly, they understood the value of translating virtual activity into a real-world experience. What did the cookie experience cost Delta? The cookies themselves – maybe a couple of dollars. A platter and some plastic wrap. A gift card. 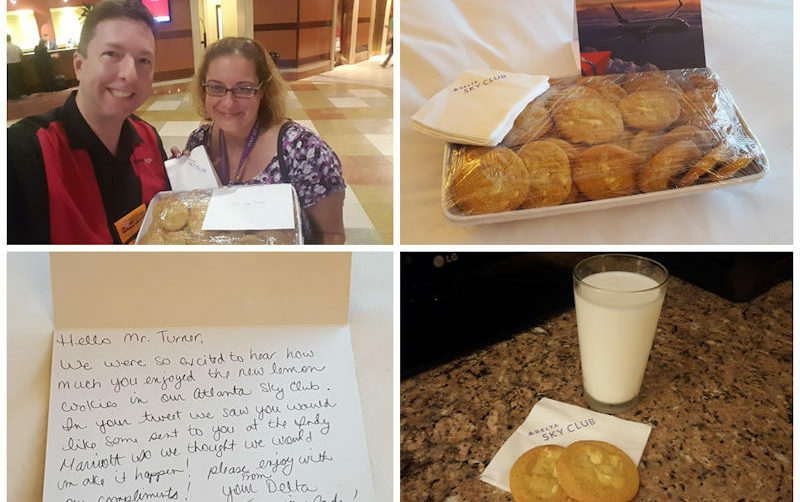 A flight attendant went above and beyond her normal responsibilities to pick up some cookies at an Atlanta Sky Club and drop them off at the Indianapolis Sky Club. The plane was going to fly anyway, so putting the cookies aboard was not an extra expense. Ms. Khalileh invested a little time and an out-of-the-way drive to drop them off at the hotel. In all likelihood, she personally incurred the highest overall cost for making this happen. But as a result, the Facebook and Instagram posts I made when I shared this story generated a lot of positive feedback. In addition, at least three other people who saw the story described previous negative experiences with either Delta or another airline, and committed to fly Delta on their next trip. Finally, the story will be part of my keynotes for years because of all the great qualities it contains relating to creating a magical brand experience, put together by the combined efforts of people on various teams throughout the organization. through small, low-cost efforts that begin online and end in tangible experiences. This short article was written prior to the August 8, 2016 system outage that inconvenienced so many travelers around the world. Obviously Delta is not immune to stressful situations or unforeseen circumstances, whether they stem from human error, technical failure, or uncontrollable outside factors. However, just peeking at Delta’s Twitter and Facebook feeds yesterday reinforced my experience as described in this article. They were forthcoming, apologetic, and generous. I wish I could! They are only available in the summer in the US and I happened across some a couple of weeks ago. Delicious!